Two suspected car jackers were made to walk naked on the streets with a snake dangling from the neck of one of them after the car owner consulted a witch doctor for help. The incident which happened last week in Kenya`s Bamburi Estate in Mombasa is said to have attracted public`s attention who rushed to the scene to witness for themselves. According to reports, the thieves had stolen a Toyota motor vehicle from one resident in the area a week ago. The owner had complained to police but justice on the matter could not come in his specific time that he decided to take the matter to a witch doctor. 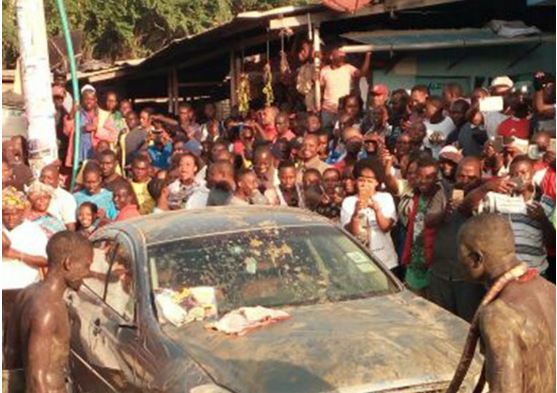 After the witch doctor did what he knows the best, suspected car jackers embarked on a journey to bring back the vehicle but while on the way, they stopped the vehicle, got out, undressed and started dancing before bathing themselves and the car in the muddy waters from the road as residents stood watching and traffic built up. As the people were witnessing the thieves’ punishment, the man behind the witchcraft stepped forward to display to the public how he would lift the spell he had placed on the car jackers. He conducted a few rituals which included showering the men and a hen with unidentified powder, before proceeding to slaughter the hen. It is reported that witchcraft has become a common occurrence in Kenya such that when cases of stealing have been encountered – more especially when the police are failing to deliver justice fast, the owners of the stolen properties are resorting into intervening witchcraft acts.